Share Freehouse opened two months ago in a space that’s seen its share of turnover. Three-two-seven Somerset was the long-time second home of the long-running French restaurant Le Metro. Then of the excellent-but shuttered-in-a-hurry Benitz Bistro. There were other attempts to fill it, but most lately, it’s where 327 Wine Bar used to be. Share is owned by the husband-and-wife team of Thomas and Maeve McVeigh. In the kitchen is Danny Mongeon, formerly of the (now-former) Gatineau restaurant, Brut Cantina, and the Rideau Street restaurant Hooch Bourbon House. At least he was in the kitchen for my first two tastes. At my final visit, just as dessert arrived, I learned he had left. About a week ago, maybe two, our server said. It explained a lot — the long wait for food and well-off-the-mark pacing (they were also down one server, leaving a single hard-working, admirably unflappable man to manage the room and patio). But here’s the thing: once the food did come, it was still very good, with Mongeon or without Mongeon. At Share Freehouse, everything on the menu is up for sharing, from cheese and charcuterie to soup and salad, steak and pie. Over the years of sampling this direction in restaurants, I’ve decided sharing – with the exception of places like Table 40 with a family-style set menu — works better as a warm and fuzzy idea than it does in practical application. Sharing at a restaurant table is more natural with a life partner than with the boss. It suits twenty-six year old women more than it does sixty-two year old men. It’s easier to share a plate of cheese than a bowl of soup. And at most places with standard-sized tables, over-sized platters simply don’t fit well. And then there’s the matter of sharing the bill. At Share Freehouse, the pricing is a bit confusing. The first price listed, closest to the dish description, is ‘For Two’. The next number is called ‘Plus One’. Single portions are available, though no price is given. So if you’re a table of six say, and three of you want to share the duck (For Two, add Plus One) and one wants a single sliders order (price of that is unclear, but turns out to be half of For Two, plus a few bucks) and all want Brussels sprouts (For Two, times 3?) how exactly that computes makes my head spin. In fact, just seeing $32 next to ‘Cauliflower’ is a bit jarring. Granted, it’s supposed to be enough for two, but Share is asking for a serious leap of faith; it had better be the best damn platter of roasted cauliflower on the planet. Ditto for the investment in forty-two dollars worth of duck. What if it is overcooked? In the end, we elected to share some starters and asked for individual mains and veg, which I noticed some tables around me were also doing. But here’s the good news about the food: it’s really good. 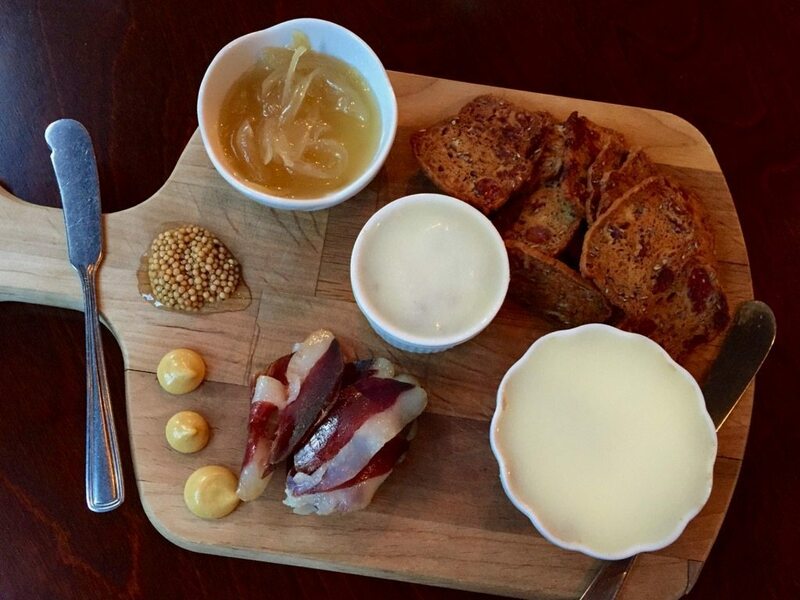 It started with a board of ‘Preserved and Cured’ — pungently smoked duck prosciutto, richly flavoured pots of duck rillette and Mariposa Farm pork creton, served with mustards, pickles and a sweet onion marmalade. House-made cranberry crisps were provided to ferry meat to mouth. 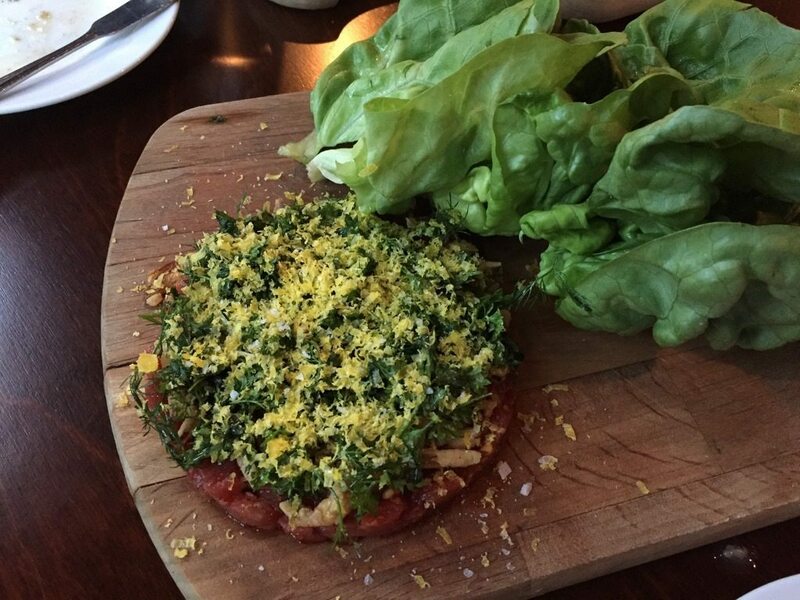 Then a beautifully balanced bison tartare. Beneath layers of crisped shallots and a rough chop of herbs was the puck of well seasoned, very lean raw meat, carefully cubed. Over this was a toupé of sunny yellow curls – grated, cured egg yolk, which added a salty, rich, eggy pop (and much more fun than parmesan). Boston lettuce leaves were provided for scooping. A salad of ancient grains with puffed wild rice and beets was fresh, balanced, with yogurt lending a nice tang. The roasted cauliflower gratin ‘soubise’ (with a creamy onion sauce pooling beneath) came with steel cut oats, puffed wild rice, tart cranberries, and the same dill-parsley salad we had on the tartare. Individual mains were an impeccably fresh and precise piece of trout and juicy slabs of ruby duck. 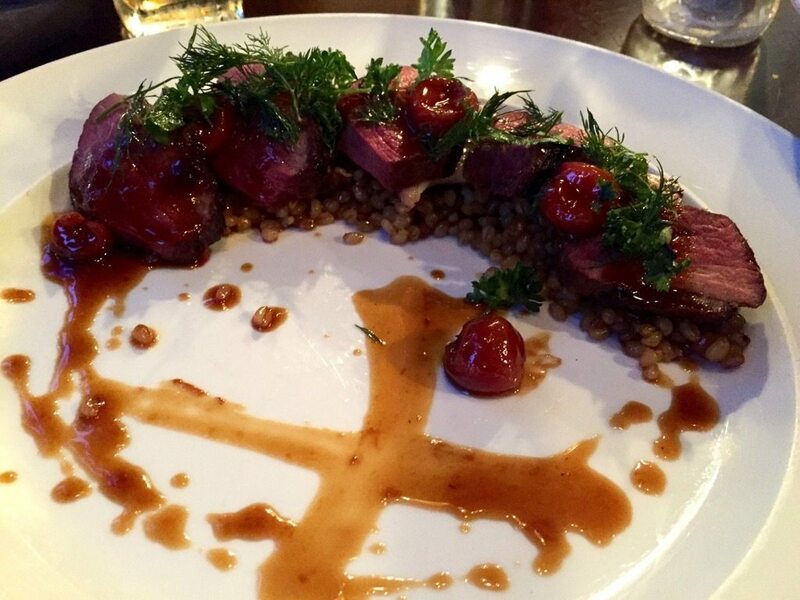 The fish shared the plate with heirloom potatoes and fiddleheads; the duck with braised wheat berries, king eryngii mushrooms, pickled sour cherries, and a polished jus. A dessert called lemon cherry curd arrived deconstructed on the plate — hunks of spongecake, a scoop of buttermilk ice cream, coral coloured blobs of lemon-cherry curd, dots of cherry coulis, and meringue in crisp, torn sheets. Very nice. 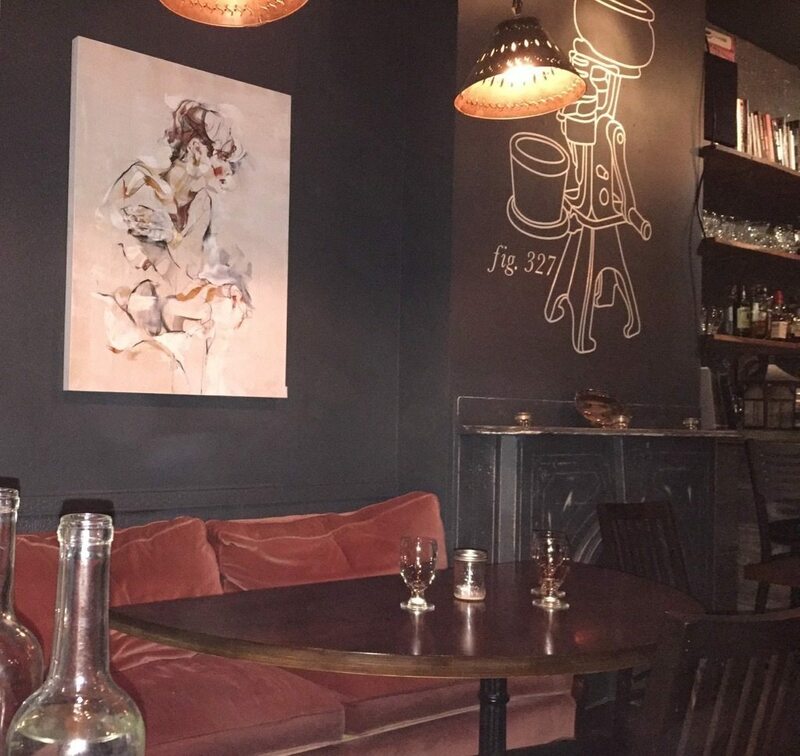 We didn’t try a cocktail — the bar was already taxed — but the bitters, cordials, syrups, and such are house made, and you’ll find quite the whiskey list here. There’s a good selection of craft beer, on tap and in bottles, and the wine list has enough variety to please, at prices that are neither kind nor overly unreasonable. They were down the chef, a server, and a bartender on our final night, so service was a bit of a mess. Still, we ate well. If Share keeps that part working, perhaps the rest will follow.